The Miami Marlins did not record their first hit until the seventh inning on Wednesday night. It took an Emilio Bonifacio infield single in the fourth inning to break Thursday’s hit barrier against the Reds. I’ll give the Marlins the benefit of the doubt for Wednesday’s dismal offensive performance because of the hype of the new park and of Opening Night. But Thursday’s three-hit performance was inexcusable, especially with the lineup Miami puts on the field. I wish that the home run feature in centerfield of Marlins Park was as hard to come across as Miami hits. We all know the 70-foot sculpture is an eyesore, but is it hurting the team? With such a potent lineup, how come the team has scored just one run in two games? My brother proposed today that the feature is a curse, such as the Cubs’ billygoat, or the old Red Sox’ Bambino trade. So until the sculpture leaves, the Marlins might not even make the playoffs again. If the offensive slump continues, it might be the only explanation apart from poor team chemistry. The four Marlins infielders, Hanley Ramirez, Jose Reyes, Omar Infante, and Gaby Sanchez, were all All-Stars in either 2010 or 2011. Giancarlo Stanton is capable of hitting a home run every time the Marlins put the bat on the ball, and Emilio Bonifacio is fast enough to beat out any ground ball. So the Marlins should be getting ten hits a game, but have combined just seven hits and one run in their first two games. It could just be a slow start, or we could really be on to something. 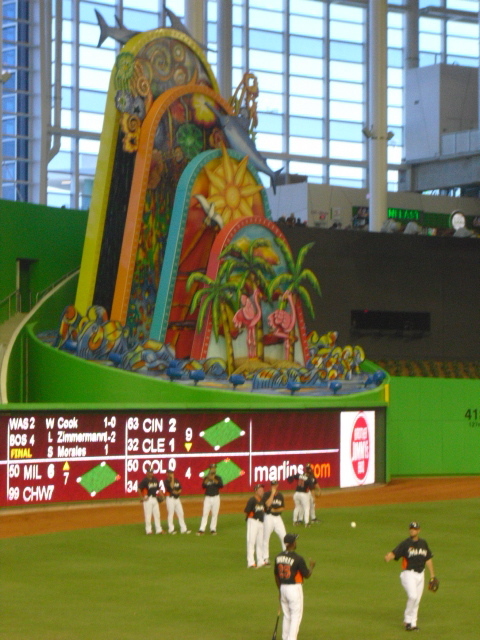 The gaudy home run sculpture, which gives off smoke, lights up, and has its figures dance after a Marlins home run, is only a distraction as it: 1) Diverts attention from the field; 2) Humorously becomes a batting practice target; and 3) LITERALLY causes left-handed batters to lose the ball out of the pitcher’s hand. I would like to build on points 2 and 3. I believe if lefties keep complaining about the sculpture, the MLB will force the Marlins to either move it, or get rid of it. Team owner Jeffrey Loria insists it is there to stay for quite a while because of its enormity and expense. The entire stadium cost $515 million, and $2 million alone was devoted to the sculpture. On top of that, as a result of the Marlins fraudulent financial reports, taxpayers in Miami-Dade County were forced to pay $360 million of the $515 million price tag. Loria, an art aficionado, was in no position to add unnecessary, or destructive, flamboyance to the already expensive stadium. So, I’m not sure if I’m really allowed to do this, but I want to put a bounty on the sculpture. With $2 million invested in it, the thing must be rather sturdy, so I doubt any hitter could damage it significantly with a simple home run, but I am offering to the first player who hits it in a game a 1200 word blog post analyzing his swing. And to anyone who drills one of the two marlins (either in BP or a game) on the sculpture so that it does not spin when the feature is turned on wins a 2000 word post on the same thing, and any other cool information I can find about the player. I doubt that this sculpture curses the team, and aren’t curses just conclusions based on coincidences “evidenced” by questionable events? Did the billy goat really curse the Cubs, or have they just been a bad team for almost three quarters of a century? 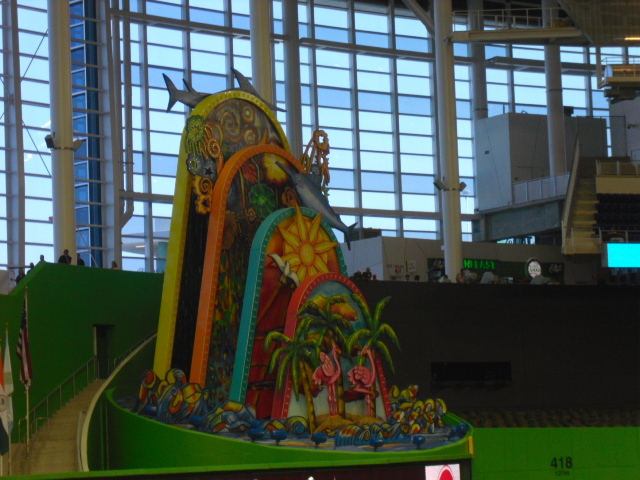 So the sculpture may not be a curse, but a distraction that gigantic will consequently divert the team’s attention away from work, and could be a direct, or indirect cause of a slow start for the Miami Marlins. Update: Dan Uggla became the first player to hit the sculpture during a game, unfortunately, it did not malfunction. Here is the post.